Javier Martínez Acha, through whom the money trail from the Martinelli scandals leads, and who has had nothing specfic to say about it for public consumption. Martínez Acha was undersecretary general of the PRD and a key operative in Juan Carlos Navarro’s failed presidential campaign. Photo from Martínez Acha’s Facebook page. The PRD candidate in the 2014 election cycle, Juan Carlos Navarro, is charging long-time intra-party rivals Mitchell Doens and Francisco Sánchez Cárdenas, with criminal defamation, known as calumni e injuria here. So what, specifically, is the lie that Navarro said that they told about him in La Prensa? “Their recent reckless accusations, which appeared on Saturday, October 24 in La Prensa, ARE TOTALLY FALSE.” Specifically how? Navarro doesn’t say. But at an October 26 press conference, the erstwhile PRD leader responded to that story by stating that “none of Mr. Virzi’s companies, the accounts that were mentioned, Hidalgo & Hidalgo — from none of these were funds obtained in a fraudulent operation.” He also denied that Javier Martínez Acha had been his campaign treasurer. The existence of a Trojan Horse in the Democratic Revolutionary Party (PRD) campaign in 2013 would be demonstrated in the management of accounts and money of one of its directors, Javier Martínez Acha, and suggests that the then president, Ricardo Martinelli, would have penetrated the party. Suggests, perhaps, but does not fully prove. This is the stuff from which money laundering investigations are started rather than properly summed up. That Navarro and his Blue Wave campaign that marginalized party old-timers including Doens and Sánchez Cárdenas were Martinelli plants is not a new allegation. The most noteworthy fact proffered for this conclusion was an August 2013 meeting between Navarro and Martinelli in the office dining room of businessman Mayor Alfredo Alemán. Alemán had been treasurer of Ernesto Pérez Balladares’s successful 1994 presidential campaign. Both Navarro and Alemán have acknowledged that the meeting took place but have dismissed it as a happenstance encounter at the office of a Navarro’s and Martinelli’s mutual friend. It has also been alleged that present at the meeting were Martinelli’s personal secretary, Chichi De Obarrio, and Pipo Virzi. De Obarrio is now a fugitive who is wanted in connection with several Martinelli administration scandals. Prosecutors here have requested an INTERPOL “red alert” bulletin for his arrest in and extradition from wherever he may have run. Virzi is under house arrest and the records of his Banco Universal — in many ways a financial clearing house for Martinelli era corruption — have produced paper trails into many different public corruption scandals and provided links to the Financial Pacific brokerage firm, itself a hub for a lot of different criminal activities, some of them associated with Ricardo Martinelli and his close collaborators. So Navarro is apparently now so annoyed with the continued allegations and insinuations that he’s bringing charges against Doens and Sánchez Cárdenas — but not La Prensa. And which lawyers has Navarro sent into the fray? Rosendo Rivera and Gabriel Carreira Pitti. Rivera was Martinelli’s lawyer, but they had some sort of falling out and it was later revealed that Rivera was one of the targets of Martinelli’s illegal electronic surveillance operations. Much of that electronic spying was carried out with Israeli equipment bought through a company called NUNVAV. Gabriel Carreira Pitti was the lawyer who organized NUNVAV’s Panamanian subsidiary. One of the hallmarks of paranoiac ideation is the unwarranted presumption that lines of connection are lines of causation. Panama’s inbred rabiblanco aristocracy and treacherous political caste create may opportunities for this. Want to find further interesting PRD ties with Virzi? See the board of directors of Banco Universal before intervenors from the Banking Superintendency took it over, and see PRD notable and former diplomat Eloy Alfaro (who now denies that he was the board’s spokesman, although corporate filings listed him as such.) See Dora Pérez Balladares Boyd, the daughter of the former president. And if there is anything to the widespread but unspecific allegations that Panama’s securities industry corruption goes way beyond Financial Pacific, we can start with a who’s who in the nation’s securities broker business. It’s a small country and there are many overlapping and intertwined lines of connection, but what they all mean is another set of questions. Now that Navarro has taken recourse to the criminal defamation laws, it perhaps gives the defense a golden opportunity to uncover strings and figure out who pulled them. That Navarro directly denied things that had not been directly alleged, and got vehemently specific about the rather inconsequential detail of what title Javier Martínez Acha held when working for the Navarro campaign, perhaps raises certain warning flags. Navarro is a spent political force — as are Doens and Sánchez Cárdenas — and one wonders what, beyond egos, anyone in this argument has to defend. Within the PRD, however, and most probably among the influential people at La Prensa, there are some real interests to be affected. Within the corporate mainstream media, for example, consider that Navarro is married to the daughter of the founder of Panama’s ad agency cartel, and she’s still a player on that scene. More important than that, consider that along with Navarro, in the internal PRD warfare that resulted in the Blue Wave victory over the party’s older guard, came Benicio Robinson as party president. With Navarro’s hasty exit after his defeat, Robinson emerged as the big boss man of the PRD and many party members, coming from many different directions, don’t like that at all. Robinson put off internal party elections until July of 2016 and has been busy packing the bodies that will run those elections with his own loyal supporters to the exclusion of other party tendencies. But Robinson was unsuccessful this summer when he formed an alliance with Ricardo Martinelli to take over the National Assembly, end all investigations against Martinelli and his people, install Martinelli’s notorious henchman Sergio Gálvez as president of the legislature’s Credentials Committee and start impeachment proceedings against President Juan Carlos Varela. Robinson failed because he couldn’t secure the votes of about one-quarter of his caucus and Martinelli lost he votes of about half of his party’s deputies. The Coordinadora Pro Rescate Torrijista, an alliance of seven PRD factions opposed to Robinson, complained in an October 22 pronouncement of the current party in crowd’s “cold, calculated perfidy.” Surely they see the money trail reported by La Prensa as but one more proof of this. But did any of these anti-Robinson factions have anything to do with the leaks that formed a part of La Prensa’s story? If one wants to get into the “who had a motive to do this?” mode of thinking, the possibilities go well beyond the fractious world of PRD politics and into the spheres of business, the legal system and personalities. 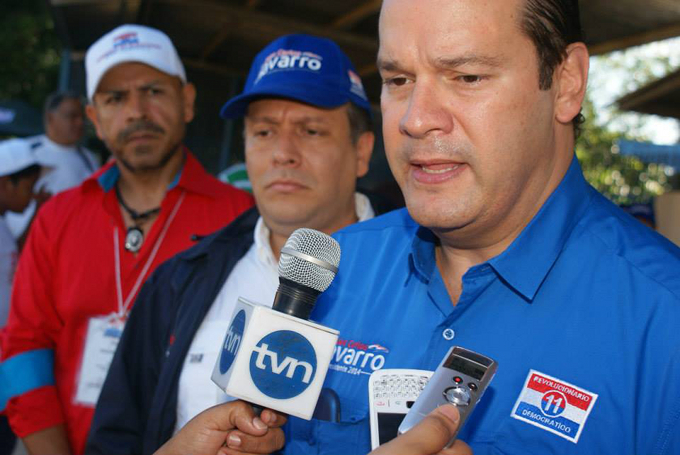 The possibility of an expanding scandal that shatters Panamanian politics well beyond Mr. Martinelli and his supporters should not be rejected out of hand. But neither should people discount the instincts of individuals or institutions to put a lid on all of this and limit the damage that the hue and cry over the systematic corruption of recent years might do to interests, careers and reputations.